Fruit Spin is a beautifully animated fruit-themed slot from the software developer giants NetEnt. 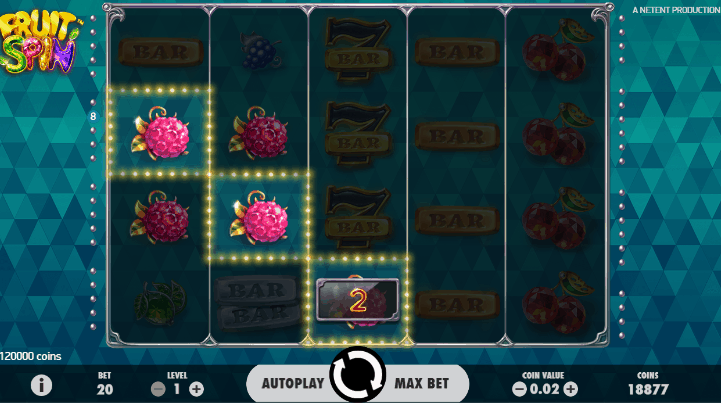 The 5 reel and 40 payline slot game has breathed new life into the over-done fruit theme. 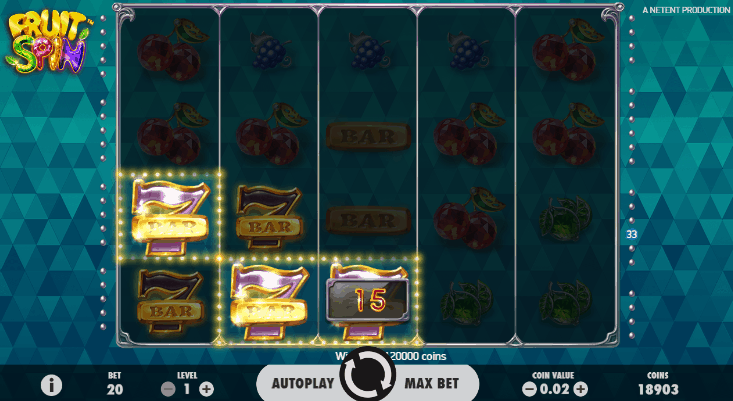 The game has absolutely superb graphics with 7's, blueberries, cherries, raspberries, limes, oranges and blueberries included as the slot symbols. What's more is that Fruit Spin has a luxurious look and feel. The fruit all boast a jewelled quality about them, which along with the plush background, add to the luxurious overall feel of the game. Lucky Wheels Feature- This exciting bonus feature is unlocked when you land the game's Scatter symbol. The Scatter appears on the middlemost reels and comes in the shape of a 3x3 block. Furthermore, the Lucky Wheel Feature presents you with 3 wheels of fortune. Here you either win cash prizes of 20,40 or 80 coins or a free spin. Once 3 free spin symbols are picked up on the spins you activate a separate Free Spins round. Free Spins Feature- Once activated in the Lucky Wheels feature, the Free Spins feature awards with an initial 5 free spins as well as extra free spins for any additional free spins symbols collected. The Lucky Wheel Feature can be activated from within the Free Spins Round which can again lead to further free spins, although the odds are slightly different to when you activate the feature from within the base game. A very useful feature of Fruit Spin is the mobile compatibility. As with most NetEntertainment games, Fruit Spin is available on a variety of devices including tablets, smartphones as well as both iOS and Android devices. This feature makes the Fruit Spin slot perfect for players on the go. Both the Wild and Scatter symbols are stacked in Fruit Spin. Both are 3x3 blocks that appear stacked in the centre reels. This stacked feature ensures that whenever you land a Scatter, you activate the bonus round, and whenever you land a Wild symbol, you are almost guaranteed a winning combo. The Scatter symbol in Fruit Spin is a 3x3 symbol block that is labelled 'Scatter'. It appears on the centre reels and activates the Bonus feature in the game. The Wild symbol is a 3x3 symbol block that is marked as 'Wild'. This symbol has the ability to replace all symbols in the game except for the Scatter. Fruit Spin is definitely not just another fruit-themed slot. NetEnt has really pumped up this otherwise fairly simple game with astounding graphics, features worth betting for and a mellow soundtrack to keep things easy on the ears. The best feature of this game is the wheel of fortune, where there is plenty fortune to be won. The fact that the game is also compatible on almost all devices is another determining factor to give this slot a try.